This 513 Rue Saint-Nicaise (only Nicaise during the revolutionary period) was the address of the Magasin de l'opéra (Opera House's storeroom- at that time the Opera house was Porte Saint-Martin, nowadays Théâtre de la Porte Saint-Martin), also called Hôtel de l'Académie royale de musique before the revolution. After the revolution it was the head office of Etienne Charles who published many political books (among them the well-known Moniteur). - a political trend that refers to real historical players or events of 18th century's France and Russia. The building was located near la Place du Carrousel, thus very near Les Tuileries, centre of the power in Louis XVI's last years and beyond. This 513 Rue Saint-Nicaise (only Nicaise during the revolutionary period) was the adress of the Magasin de l'opéra (Opera House's storeroom- at that time the Opera house was Porte Saint-Martin, nowadays Théâtre de la Porte Saint-Martin), also called Hôtel de l'Académie royale de musique before the revolution. After the revolution it was the head office of Etienne Charles who published many political books (among them the well-known Moniteur). We have, that Sauveur had been active with a troupe of comedians in the colonies, possibly 1802-04. Also we have, that Sauveur had a publication about great persons of the theater, "Galerie dramatique ou Acteurs et Actrices célèbres qui sont illustrés sur trois grands Théâtres de Paris: Ornée de soixante portraits". His address in Bordeaux had been also close to the theatre (around the years 1798-99). Occasionally he published at "Chez Barba". Barba sold mainly books for the theater play market. btw ... what's the source for "magazin de l'opera" at 513 Rue Saint-Nicaise? So that confirms that S.-Sauveur was working on stage at least as early as 1800, and with jesters of some celebrity (enough that later buffoons were spoken of as being in the tradition of Thiemet or Fitz-James). "Of jesters well known and spoken of the most, Thiemet is the finest, with his original and comical proverbs and talent for imitation, he plays as much to the eye as to the ear, his face displaying an entire pantomime..."
Fitz-James was a ventriloquist; who "speaks from the stomach with more ease than some speakers speak from the throat." One anecdote has him causing consternation and amusement in a restaurant where he was with friends, when "he counterfeited the voice of a thief hiding in a walled fireplace..."
(This may have been his own Cafe, which he owned with Borel, the Café Borel, au Palais-Royal, jardin du Tribunat, both (Fitz-James & Borel) being noted in French wiki entry on ventriloquism as being 'excellent in the art of ventriloquism'). "Fitz-James, ventriloquist, is back in Paris. He saw in London the most avowed enemies of France, including former General Danican, now employed in German recruitments for England. The Commissioner of Police is responsible for the arrest and will send a copy of the examination that will make him suffer." Police report to 'Note to the Minister', 21 July 1804 in La Police secrète du Premier Empire by Ernest d'Hauterive. ... on a map of 1736. The number 513 is rather high for such a short street. It can only explained, if a very big house was parted in many appartements. Or Paris had taken the habit to count the houses in Paris independent from the street (which they later used for Cologne, "4711" became such a famous number). On 3 October 1794, in view of the French troops standing just outside Cologne, the city council approved a plan proposed by the guard-committee to number all houses in the city without exception and to install what would be considered appropriate lighting for each location. Orders were given to install the lighting immediately, while the numbering was left to fate. On 6 October 1794, French troops occupied the city. On 7 October 1794, the city council decided that every local government official had to hand in an inventory of all citizens and non-citizens in his district within 48 hours. Furthermore, the guard-committee received authorisation to number the houses as previously agreed. On 20 October 1794, Senator Gottfried von Gall noted in his diary that the numbering and the written documentation of the houses which started eight days earlier was being continued. The printer Heinrich Josef Metternich (a council member) applied for permission to publish an address calendar. This calendar was supposed to include, amongst other things, the house numbers which had recently been assigned. He also sought permission to collect all the relevant details. In the second address book of Cologne (1797), the widow of Wilhelm von Lemmen seel. was still listed as the tenant of the Klöckergasse house, which had been given the number 4711. I don't understand this conclusion. ... belongs to the later time. Sauveur left the address in 1797, I think, I remember to have seen the Coq-heron address also once for this year. ... but Sauveur was long gone. There was a bombing attack on Napoleon in 1800 in this street. The dates given by biographies of JGSS performing vary. The addresses are for Thiemet and for the ticket seller, Fridzery (and I guess the place of performance?). The advert says that Thiemet is joined by Boyer, Fitzjames, S.-Sauveur and another artist. I am presuming the title that Philippe has given the image, 21 Pluviose An VIII (10th of February, 1800), is a reference to the date of the source (it would be nice to have reference to the source itself). 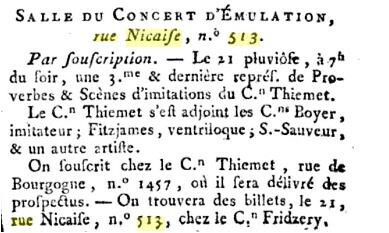 So that would confirm that S.-Sauveur was performing in February, 1800, at the rue Nicaise, 513. The advert says that Thiemet is joined by Boyer, Fitzjames, S.-Sauveur and another artist. I am presuming the title that Philippe has given the image, 21 Pluviose An VIII (10th of February, 1800), is a reference to the date of the source (it would be nice to have reference to the source itself). 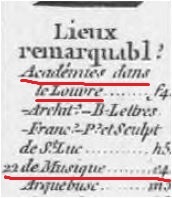 So that would confirm that S.-Sauveur was performing in February, 1800, at the rue Nicaise, 513. Looks both good, thanks. I overlooked the name S.Sauveur first. For Thiemet, I found this description ..
Fridzeri founded LA CHAMBRE PHILHARMONIQUE in 1798. 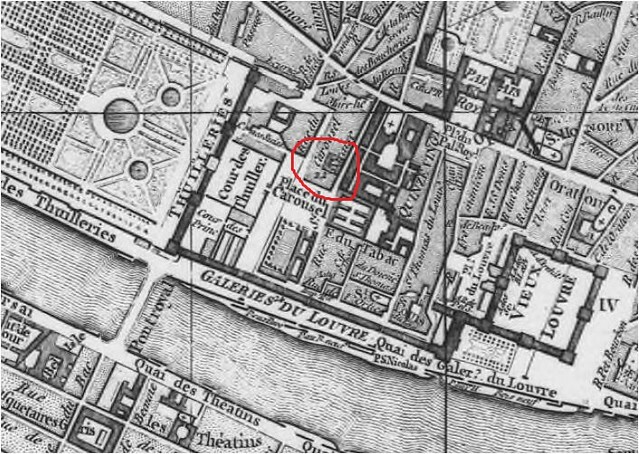 Sessions were held at the Old Opera Store (magasin de l'opera), which was also called the hotel of the Royal Academy of Music under the old regime, Rue Saint-Nicaise 513, in the Cour du Carrousel. Le citoyen Lamarre, residing at rue de Lille, n° 670. A declaration by Fridzeri, in response to a claim of creditors, is also signed by Baillot, Lamare, Duvernoy et Grasset, 31st December, 1798. Fridzeri held courses there on harmony in the Chambre Philharmonic, the rooms of the 'Concert d'Emulation' were for rehearsals and concerts, but were also hired for public meetings, such as by the School of Performing Arts. There was also a printer, Charles, registered at the same address. * rue St Lazare, No. 88 was the address of a well-known public hot-bath house, the Bains Tivoli. Not sure how, this was an artists 'residence' ? ps: Duvenoy, Grasset, Lamare & Baillot were musicians ( Duvernoy arrived in Paris on the eve of the French Revolution in 1788 and became a horn player in the orchestra of the Italian comedy. In 1790 he was a member of the orchestra of the National Guard. In 1797 he joined the orchestra of the Paris Opera, which he is principal horn in 1799. The other three were celebrated violinists), who with other musicians often performed together in quartets and Boccherini quintets (i.e., this "citizen Grasset" is not related to our citizen Jacques Grasset S.-Sauveur).